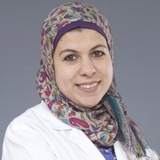 Dr. Mona Ahmed Yousry El-Ghitany has obtained her MBBCH from the Faculty Of Medicine Alexandria University, Egypt. She later obtained her Master Degree of Diagnostic Radiology from the Faculty of Medicine, Alexandria University, Egypt. Dr. Mona started her career as a Medical House Officer at the Alexandria University Hospital in various different departments. She went on to become a Radiology Resident in the Diagnostic Radiology Department in Alexandria Main University Hospital, El-Shatby University Hospital. She continued to be a Radiology Specialist in Saudi German Hospital and Al-Manaa General Hospital before becoming a Radiology Registrar at NMC Hospital, Dubai, UAE. Dr. Mona is well versed in Arabic, English, and French.